For most of 2011, news of broad economic uncertainty and low consumer price inflation belied significant wholesale price inflation. Polymers, primary metals and other globally traded intermediate products saw multiple price increases through the first half of this year. But the chemicals sector has turned. Inventories are up. August saw the beginning of broad downward pricing pressure across the chemicals sector. 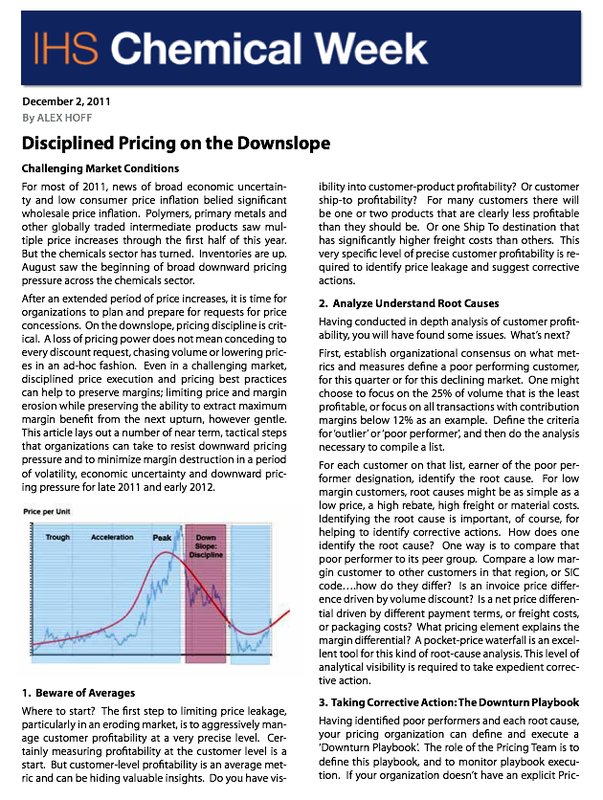 This article lays out a number of near term, tactical steps that organizations can take to resist downward pricing pressure and to minimize margin destruction in a period of volatility, economic uncertainty and downward pricing pressure for late 2011 and early 2012.